I'm happy to say that Cece has been really getting into solving crosswords. So we sat down to work on this one together. I was all excited, because Patrick Berry, am I right? Only (blasphemy) this wasn't all that great. I mean, it's smooth and all, as befits Mr. Berry's work. But the theme... well. Clever to find seven examples of phrases that you can rotate the first letters and make new words, but only one of them made me and Cece actually giggle. Can you guess which one? Yes, it was 60A: Description of a yeti? (PALEHAIRYMASS). This hits on all three levels of this sort of theme. First, the original phrase, "Hail Mary pass," is rock solid and common usage. Second, the clue is simple and precise, but unexpected. Third, it's just stupidly funny. The others miss on one or the other of the requirements. I mean, THESTUCKHOPSBEER? And also, the puzzle title is little more than a straight description of the trick. Anyway, so I was a little disappointed. But it's only because my hopes were so high. On the other hand, at least TITMICE and THIGHS were right next to each other. Perhaps Horace will be a little less severe. 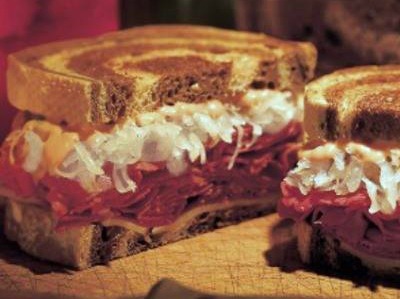 Mmmm.... reuben.... Oh, hi! It's Horace again. Feels like it's been ages since I wrote a review! And I'm not really sure if that's a good thing or a bad thing. Let's agree that it's both. I like the ludicrousness of the theme answers, but they sometimes took me a long time to understand. PALEHAIRYMASS, in fact, was one that took me quite a while. I liked THEFANTATRAYSALE (106A: Best place to buy a platter of fruit-flavored sodas?) (OK, that's weak), partly because my Dad just started doing the NYT puzzles this week, and I thought he might like that the un-spoonerized phrase is the Santa Fe Trail. He's really more of an Oregon Trail man, but... well... and he might also enjoy THESTUCKHOPSBEER (again, wow...) because I'm pretty sure he's visited Harry Truman's house. Anywho.. aside from the theme, we do have some nice long fill, including the tricky PENALCODE (83D: Rules for forming sentences), the amusingly straightforward TRASHPILE (2D: It's a bunch of garbage) (I had TRASHheap for a short time), and ABSTAINED (82D: Stayed sober) is a nice word, even if it isn't always such a fun activity. :) 37A: Chill in the cooler (DOTIME) was tricky, and USURY (16D: There's enormous interest in it) was very good. Overall, it was ok. How's that for less severe? Perhaps tomorrow I can be more FLORID. I liked the PENALCODE/DOTIME pair, and enjoy, in general, Spoonerisms, so this gets a thumbs-up from Huygens over here. KTEL is always excellent (I own two of the mentioned albums), and it's always great to have EBERT brought to mind. I'd have liked ORBACH to have been clued as "Should I play some Vivaldi..." or similar, but I guess the existing clue is stronger. I agree with Colum and Cece about PALEHAIRYMASS, definitely the best of the bunch. Too bad PETERS wasn't clued with "Mozart in the Jungle." I guess my only complaint would be that it went a bit fast for my Sunday taste.